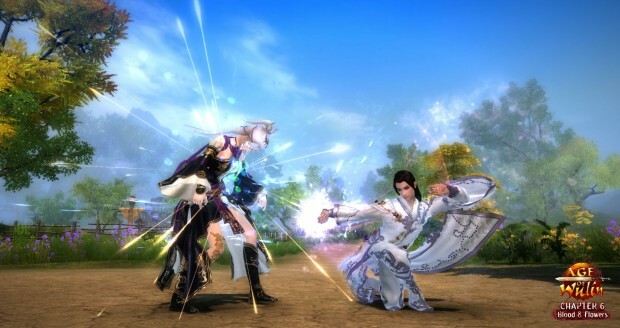 Webzen’s martial arts MMORPG, Age of Wulin, is getting ready to drop yet another expansion later this month on June 16th. Entitled “Chapter 6: Blood & Flowers,” this expansion sets the stage for the Lingxiao City battleground, adds a new instance for high level players that have completed items in Chapter 5, and adds the new Partner System to encourage players to band together. The gates of Lingxiao City will be thrown open as competitors sign up to join the battleground. Players will be randomly assigned one of three factions at the start of battle and your faction assignment will dictate your objectives during the match. Take the city or defending the city are both on the table as faction assignments roll out. The Shifting Flower Palace adds a bit of mystery as this faction will open its doors once a month to top players in various categories and allow those players to compete for the title of Flower Prince. Win the title and you’ll receive access to the Shifting Flower Palace, a new title, new costumes, and access to a new Ancient Skill set. For you PvE-ers out there, the Island of Delight instance continues the stories laid out in Chapter 5 from the Silver Hook Sword Boat encounter. Finally, the new social based Partner System allows players to band together and earn loyalty. You’ll even be able to summon your friends into battle and learn from their Combat and Internal skill sets as well. Check out the official website for all the details. You can’t make a pile of poop better, with simply putting glitter on it…unless your name is Activision or EA.